The first full day of biking in Paraty, Brazil - home of the 2014 Urban Sketching Symposium - began the way these things begin: my wife and I ate breakfast before I walked her to her first workshop. That meant stepping, Indiana-Jones-through-the-temple-to-get-the-golden-idol-like, among the swollen cobblestones. Upon return to our room, I grabbed my bike, put on my backpack and hit the door. I had already made the decision to go north toward Sao Paolo and hit Trindade - a beach destination that was recommended to me. Five minutes after setting off, it rained for ten solid minutes. Water soaked into my clothes and into my pack - and the rear tire of the Bike Friday spat a steady stream water at my backside like a malfunctioning bidet. I'd like to say it didn't dampen my spirits, but it did. Especially since the road I was on was, for lack of a better term, boring. I appreciated the wide shoulder and enjoyed the quiet but some stretches felt like roads in southern New Hampshire. It was also mostly devoid of people. A few cars and motorcycles passed but no pedestrians - save for an old man with a long beard and tattered clothing sitting alone at a bus stop near an equally tattered bike rigged to haul a trailer made from an old baby carriage. I looked his way and gave a smile and a wave, but he didn't return my gesture. Several miles after passing the old man by, I came to the something that was worth taking a picture of. Okay. I don't see that in southern New Hampshire. Or Stamford. Keep it up, Brazil. Not long after this I came to the turnoff for Trinidade. An arrow pointed left and said '500 m' so I knew it wasn't far. I remember, back when I changed the three-ring chainring on the Bike Friday just before meeting Stacey I wondered if I'd eventually regret giving up the little ring. It was a killer ascent. Much harder than the 1,000 feet I climbed in Virginia on the Dahon Matrix. Motor vehicles rarely went by and I saw no cyclists. I had to stop often, and when I was pedaling I was struggling to do much more than walking speed. When the hill began to crest I was greeted with a crude, covered bus stop and a sign at a fork in the road indicating Trinidade was 5k to the right. Trinidade was all downhill, but I decided to go left - and thus continue climbing - just to see if this exhausting trek would give me a nice vista from which I could take pictures. Unfortunately, a few moments into that adventure, I heard thunder and saw dark clouds closing it. I barreled back to the bus shelter but was too late: the sky opened up and I was soaked again. Thanks a lot, sun. Thanks for heating and warming the earth like we agreed. After I removed my jersey to wring it out and put it back on again, I decided to just go to Trinidade - which meant the 1,000 or so feet I had just climbed was going to be another 1,000 feet to climb on the way back - because the descent to Trinidade was steep. Because of the narrow road and the blind corners I rode the brakes almost the whole way. But I did make it a beach. Instead of finding Brazilian beauties on the beach willing to cater to my every whim (which, at the point, consisted of handing me a large towel, replacing my brake cables and cleaning off my bike) I found no one - and remembered that August in this part of the world was the official 'off' season. After a sandwich ordered through a language barrier at the Bar Do Cepilo, I continued on toward Trinidade (carrying my bike over the 'slippery river') and for the third time, it rained. This time it was so cold my teeth were chattering. Lucky for me, I found the town a few minutes later - and the rain began to let up. I passed a lot of empty and closed shops and restaurants - it really did feel like the off-season. 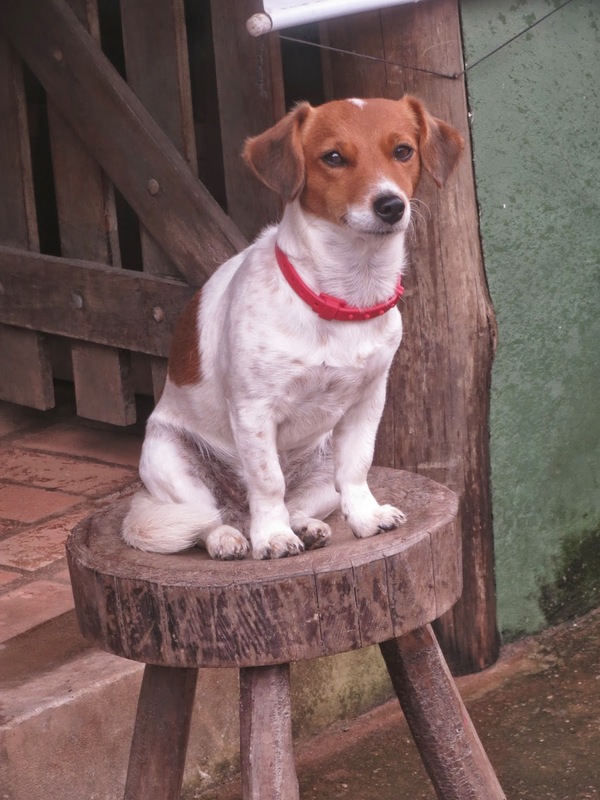 On the way through town I came across a dog sitting on a stool - and after I pedaled around for a little while and returned, the dog was still sitting there so I took a picture. Still soaking wet I made one last ride through town before heading back. But since I wanted to procrastinate making that awful climb again, I turned right instead of left at the 'slippery river' and saw where Paraty must get the boulders it uses to pave the streets. It really was beautiful - and of course I wished for better weather. 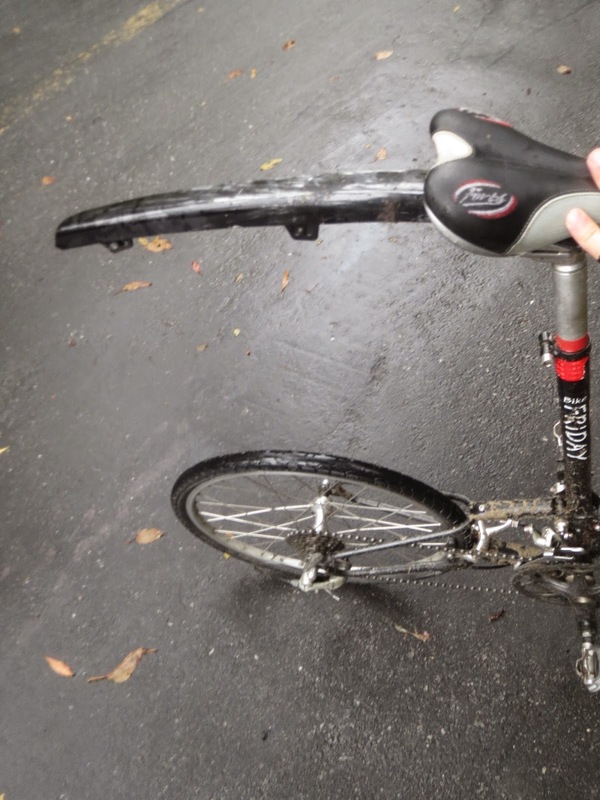 But on a cycling vacation you ride with the weather you have and you improvise to make it more comfortable: on the climb, I noticed small bits of a car bumper on the side of the road and used one to make a fender for the Bike Friday. It managed to cut the 'malfunctioning bidet' effect of the rear wheel - and I was glad to have it. But for the rest of the ride I didn't need it much because the rain had stopped and the roads were finally drying up. After another thigh-burning climb and a brake pad-melting descent, I had open road all the way back to Paraty. Since I wasn't blinking to avoid getting rain in my eyes, I was able to see things on the way back I didn't notice on the way up - like Jesus at a garden center. Even though more than three hours had passed since that morning, the old man with the beard and the bike was still sitting silently at the bus stop. Again, he didn't look up at me. Since I was on the same side of the street as he this time I noticed his bike's chain was broken - which made me wish I spoke the local language and brought more tools with me. Months later, I still wish I had stopped to try to help him anyway. I returned to town, bought a piece of lemon pie at a shop (lots of pointing was involved) and again admired how the town moved. I returned to the room and later reunited with my wife who showed me some of her Paraty sketches. Like me, she was affected by the rain, but like me, we were both hoping for better weather the next day - and looking at the bright side because I didn't get a flat tire. I was sure that would change because I was determined to go west and to the mountain. Wow, what a grand adventure this was! Good job, here in Florida it is always raining, so we get a nice layer before getting to work. Stay safe!